Employees enjoy predetermined routes and shifts, paid actual time, bi-weekly pay, health and welfare, steady home time. Well maintained clean, newer model equipment. Continuous safety training. We are committed to providing our employees a stable and safe work environment. Creativity and innovation is encouraged to improve the service we deliver. Our employees are provided respect and can-do attitude within the organization and are expected to share this same value with our customer the USPS. 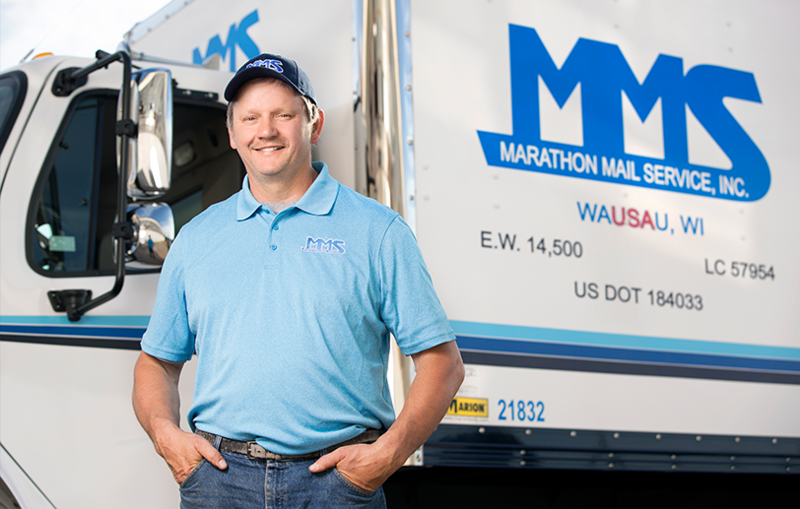 Marathon Mail provides employee benefits including competitive salaries, comprehensive medical, Life, retirement plans and match. MMS Health Insurance package is through WPS Aspirus arise plan. There is a lower and higher deductible available. It includes a co-pay for office visit with drug card. Guardian Short term disability available providing up to 26 weeks of benefits, a maximum of $200.00 per week. Guardian Basic life provides $15,000 for the employee/2,000 for spouse/$1000.00 for children in the life insurance coverage with accidental death and dismemberment. Aflac is available per the AFLAC agent, if requested the representative will contact directly. Safety bonus is paid quarterly, part time and full time employees are eligible if they do not have any incidents within the quarter. This is achievable and on average 98% of employees receive bonus consistently. Driver referral bonus is paid to the new driver and the driver that was referred. 250.00 is paid for the first full month worked and 250.00 is paid at nine months on employment.